Static window clings can be used in any type of business. These full-color window clings and decal printing puts your message all over town. Removable, reusable and repositionable, it's applied from the inside so your customer can see the ads from the outside. Our custom 18x24" static cling for car windows are very popular and a smart way to advertise your business to a larger group. 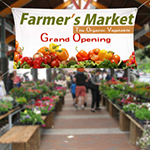 Try our full color vinyl banner printing which will sure to make store annoucements like grand openings and sales stand out to those who see it! Window static clings adhere resolutely without the need of an adhesive. Static clings are the best means for a large variety of advertising and graphics applications. 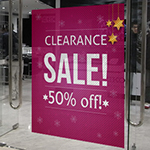 Our general static cling vinyl can be used in store windows and doors, windshield labels, appliance displays etc. We offer high quality static clings at a very low price. You can choose from a variety of choices depending on your need. Order our 24"x30" restaurant window clings and draw the attention of your customers towards the mouth watering deals you have. While you are ordering our restaurant window clings, do not forget to also order our wide variety of 8.5"x11" menu brochures for the new menus introduced at your restaurant. Window Decals are digitally printed on white static cling material. We offer high-quality static cling decals. Clear static clings are digitally printed on clear material that keeps visibility through windows. Window cling posters can be designed according to customer need. They are ideal for businesses, offices, restaurants, store fronts - for any advertising campaign that will help you to spread your message to each and every person passing by the window. Your window stickers will increase visibility and naturally bring customers to you! 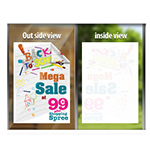 Window Clings would be perfect for stores that like to concentrate on advertising a new product or promo every so often. A window cling is really easy-to-use since it can be easily applied and removed; you can change it often according to your product, service or discount needs. Window static clings will leave your windows spotless after removal. Static cling window decorations allow homeowners, apartment dwellers and companies to decorate and advertise liberally while removing the need to worry about possible damage to the window. Change your window decor to match the season or advertise new sales with the use of static cling window decals. Static cling vinyl features a highly printable surface and adhesive-free surface that can be easily be removed or repositioned on any glass or smooth surface. Static cling vinyl decals are delivered on a recyclable rigid paper release liner that allows static cling decals to be die cut into virtually any shape and simplifies application of the graphic decals. It sticks to these surfaces without any adhesive and can be removed without leaving behind any residue. A window Cling is ideal for a variety of graphics, craft and decorative applications such as signs, decals, window graphics, door covering, protective masking and much much more. Static cling window film can be placed on the inside of a window to be read from the outside, with your choice of Full or Spot Color Self Cling Window Stickers, always printed in superb high resolution and optionally backed up in white. Self-cling stickers can be cut to any shape. Our self-cling window stickers are custom made to your exact requirements. 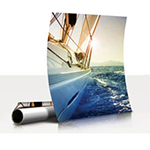 A soft PVC static cling vinyl suitable for interior and exterior use. Its clinging properties work on both sides so it adheres to smooth and glossy surfaces, such as shop windows, without adhesive. You do not even need application tape to apply it, just transfer it straight from the backing paper onto your window. It is reusable and can be removed without residue. Our working experience with you is very POSITIVE! We are pleased with the quality of your work and will definitely recommend the company to others. I appreciate for your help! Everything you've done for us has been fantastic. Use our static cling decals to get you message across without adhesive. Apply your static cling decals to many surfaces including windows of all types. Decals are made of .007 inch white or clear static-adhering stock and do not use any adhesive. Static holds the decal firmly in place. Printing Xpert has many standard sizes of static cling decals available to save you time and money! We do offer white ink or opaque color!! We are able to print 1 to 4 full colors posters.